The Flamingo Cryptocoryne’s most noticeable feature is the pale to dark pink coloration of its leaves. This unusual and attractive variety was grown by chance in one of the Dennerle greenhouses. Flamingo is cultivated only through meristem propagation in the laboratory, and is sold in a plastic culture cup. It has very slow growth in aquascapes and needs strong illumination to ensure successful development. This unique plant looks great when combined with mosses or Hemianthus, making a wonderful focal point for an aquascape. 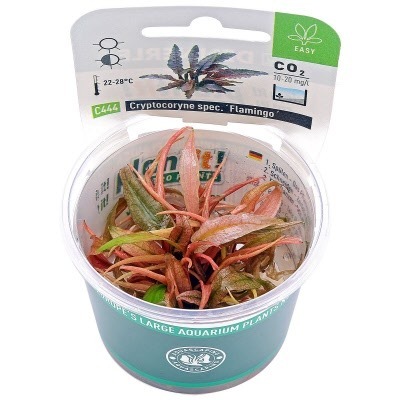 One of the benefits culture cups provide is their multiple small plantlets that can be divided out and spread throughout your aquascape, so you get great value for the price.